Feeling unfulfilled at work and considering jumping ship? You’re not alone. A recent study by Viacom shows among young workers, personal fulfillment is the new #1 career-goal — and when you’re stuck in a job that doesn’t let you find it, the first instinct can be to head for greener pastures. But with job-hopping numbers at an all-time high, employees are increasingly tempted to make the escape instinct their default response to adverse circumstances — and they risk losing the ability to engage meaningfully with new kinds of work or find fulfillment in unexpected places. 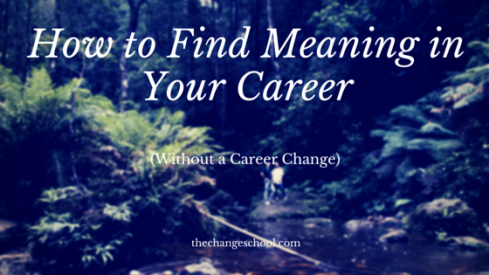 If you’re feeling disengaged at work but aren’t sure about whether a career change is the right move for you, here are a few tips for how to separate the wheat from the chaff and find your own meaning, without needing to brush up your resume. Humans are simple creatures. Generally speaking, the things we want are straightforward and can be lumped together based on a few orders of priority. Psychologist Abraham Maslow called this the Hierarchy of Needs. 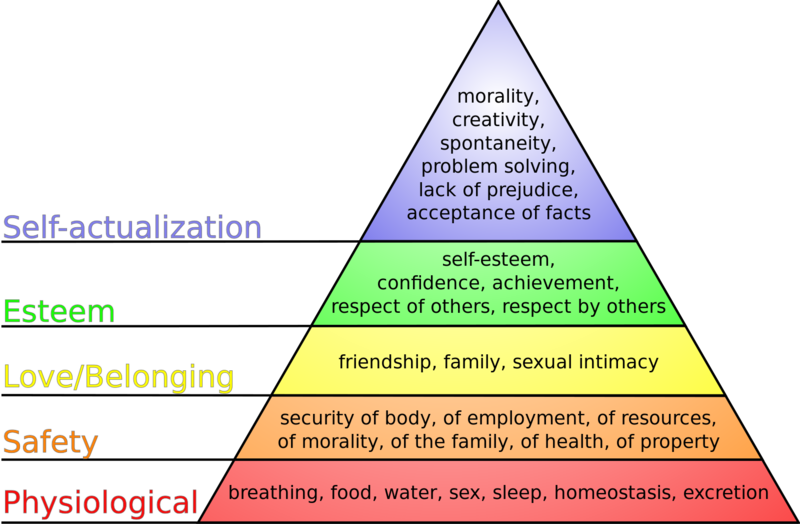 While Maslow’s pyramid-of-pretty-colors is by no means fool-proof, the basic idea is fairly straightforward: There is a spectrum which runs from things a person needs to things a person wants — and whichever one is currently causing you distress probably indicates which others you already have locked down. So before joining the Peace Corps and shipping off to Timbuktu, considering asking yourself: Which unfulfilled needs are driving that impulse? And of those, which have anything to do with your job? Most importantly: Which ones can you fix? Chances are you didn’t take your job expecting to dislike it. So before giving it up as a lost cause, think back to those fast-and-furious days of job-hunting, and try to remember what it was that drew you to your position in the first place — then ask yourself how you can convert those things into meaning and fulfillment now. Did you take the job because the work interested you? When did that stop and why? What can you do, today, to make it interesting again? Maybe you took your job for the money or a schedule that better met your needs. Ask yourself what you can do with all that newfound money or time that you’re probably just squandering on the Internet by default. Unless you’re Walt Disney or Elon Musk, chances are good that it’s just not psychologically possible for you to fulfill all of the needs on your pretty-color-pyramid at work. It’s important to strike a good work-life balance, and work is only half of that equation. Maybe it’s the case that your unfulfilled needs have nothing to do with work at all. “Take up a hobby” is a cliché for a reason: learning is linked to happiness. Why not try your hand at knitting? Or kayaking? Why not write the next Great American Novel, or buy a bike and start training for the Tour de France? Or better yet, you could transcend the work-life paradigm altogether. Whether you’re at work or at home, stop thinking about the other one. Commit to where you are, and BE HERE, NOW. Engage with your work. Put away the headphones and stop daydreaming; it’s making you miserable, by the way. When you’re at home, be at home. But when you’re at work, be at work. Knuckle down, and buckle up. Mainline some coffee, and dive headfirst into the job. Get so obsessed with details that it’s freaky; get so good at what you do that it’s almost weird. And once you’ve done that? Take that advice and apply it at your job. Start actively learning new skills and growing yourself as an employee. Build new ways of doing things, and smash the old ones to pieces. Change things and make some friction! Nothing gets better or changes through people sullenly moping. Change comes kicking or screaming. Change happens when it’s made to happen. And if you don’t make it, who will? Reorganize your workspace and make it work for you. Start ignoring the little stupid rules that get in your way, and start following new ones that you make up on the spot. Get real. Tell customers the truth, to their faces. And the next time your boss says something wrong and stupid? Tell him so, and then convince him that you’re right. Before you commit to looking for something new, you owe it to yourself to give it your all, to take your best shot, to speak up in meetings and make a big racket. After all, if you’re already mentally prepared to lose this job, then what’s the worst they can do? Fire you? You’re already thinking of leaving! So take that steely minded resolve and start doing things The Right Way, how you think they ought to be done. But be careful. While you’re busy shaking things and thumbing your nose at the forces of old and evil, you might accidentally make your job a better place — or worse, the jerks might promote you! 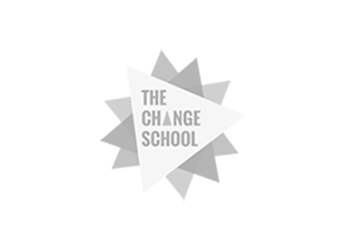 And, if all fails join us at The Change School for our signature program Change Ventures, 21 days to help you figure out your next steps with a value led community. Apply here - early bird prices till July 31st.